We've flipped the calendar over to March, which means it's time for a new Magpie of the Month here at the Court Jeweller! This month, I'll be featuring jewels worn by Princess Victoria Melita of Edinburgh, the granddaughter of Queen Victoria was a Grand Duchess of Hesse and a Grand Duchess of Russia during her lifetime. Let's kick off the month by looking at one of her Russian tiaras, a piece that resides today with the former royal family of Romania. Victoria Melita -- who got her unusual middle name because she was born in Malta -- was the third child of Prince Alfred, Duke of Edinburgh (and later also Duke of Saxe-Coburg and Gotha; he was a son of Prince Albert and Queen Victoria) and Grand Duchess Maria Alexandrovna of Russia. The princess, who was called “Ducky” by her family, was married twice. Her first marriage to Prince Ernst of Hesse (her first cousin, and the brother of Tsarina Alexandra Feodorovna) was a disaster, and she had to wait until their mutual grandmother, Queen Victoria, died before she could divorce him. Tainted by the scandal, Ducky was a bit of an outcast in royal circles, but she ended up making another royal marriage, this time to a Romanov. Her 1905 wedding to yet another first cousin, Grand Duke Kirill Vladimirovich -- the son of Maria Pavlovna the Elder, owner of the famous Vladimir Tiara -- caused further outrage, but the pair were in love. Unfortunately, their marriage wasn't exactly an unqualified success either, but so goes the story of so many royal marriages from a century ago. Today's piece of jewelry, her meander tiara, is from the time of her second marriage. Befitting a Russian grand duchess, this tiara started off as a kokoshnik. (We talked yesterday about the definition of kokoshnik -- head over that way if you need a refresher!) Look closely at the photo of Victoria Melita above; you can see the thinner bands of diamonds that mark the top of the kokoshnik shape. Those bands are set atop the fabric backing that is attached to the diamond meander, or "Greek key," design. You can even see a bit of the ribbon used to secure the kokoshnik; it's tied in a bow at the nape of Ducky's neck. She's wearing Russian court dress in the photograph, which is why you can also see a veil attached to the back of her headpiece. Appropriately, the tiara is said to have been a present to Ducky from her Russian second husband, Grand Duke Kirill. But, sadly, we all know what happened to Russian royals in the early twentieth century, so it should come as no surprise that when Kirill and Ducky fled Russia after the revolution, she sold the tiara. Ducky didn’t have to look far for a buyer. 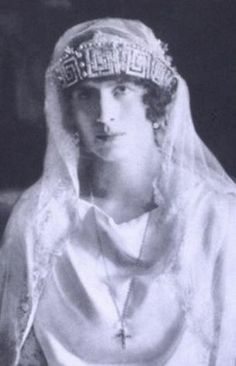 Her sister, Queen Marie of Romania stepped in to acquire the tiara. 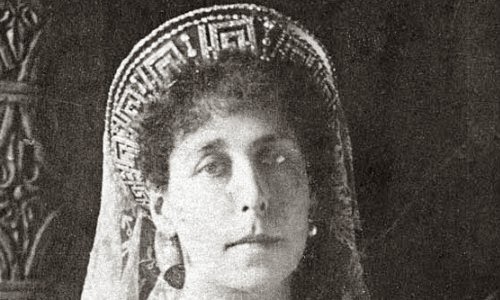 Marie was something of a sure bet for her Romanov relatives looking to unload jewels in exchange for cash; she'd lost most of her jewelry during the war, and she was looking to buy replacement pieces just as the Romanovs were in need of funds. Even so, Marie didn't buy this piece for herself. Her son, Carol, was preparing to marry Princess Helen of Greece and Denmark, and a new Romanian crown princess needed a suitably grand tiara. The motif of the tiara was also especially well-suited for a bride from the Greek royal family; in ancient Greece, the meander was one of the most important cultural symbols, representing infinity. The Greek key tiara was altered, turned into a flexible bandeau, and given to the Greek princess, who wore it at her wedding in 1921. 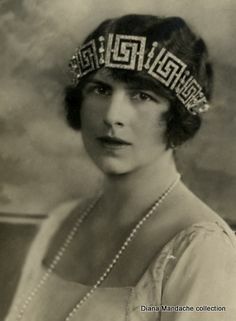 Helen frequently wore the bandeau low across her forehead, as so many ’20s princesses did with their tiaras. She also wore it suspended from bands that criss-crossed the top of her head. Carol and Helen’s marriage was, sadly, just as disastrous as Ernst and Ducky’s had been a generation earlier. But their son, Michael, did end up reigning as Romanian king before finally being compelled to abdicate in 1947. Even though he lost his throne, his family was able to retain this tiara. 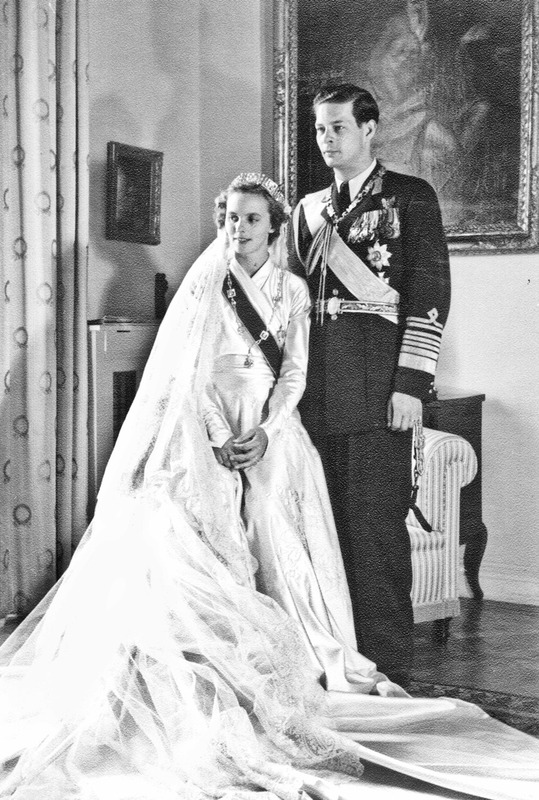 His wife, Princess Anne of Bourbon-Parma, wore the tiara to their wedding in 1948. 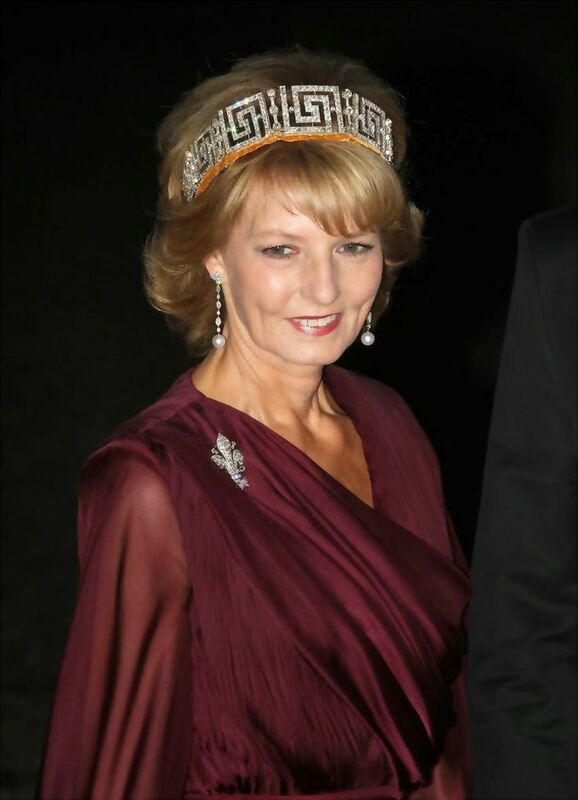 Their daughter, Princess Maria, also wore the tiara at her wedding in 1995. Today, the piece is worn most frequently by Michael and Anne’s eldest daughter, Margarita. She often represents her father at European royal events, giving her plenty of opportunities to show off the family’s only remaining heirloom tiara.